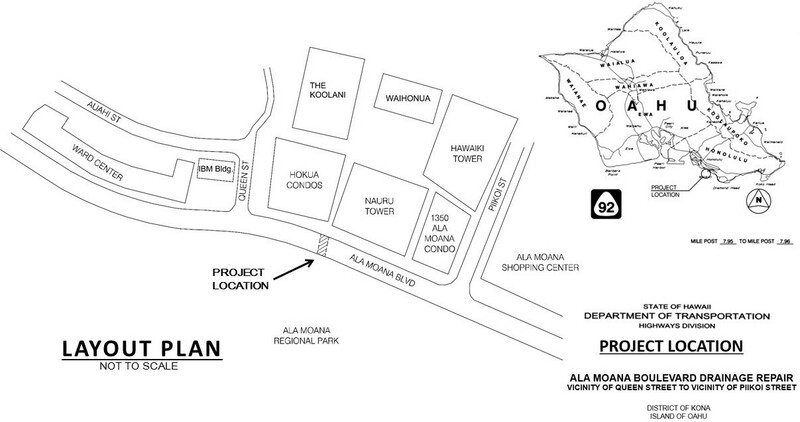 HONOLULU – The Hawaii Department of Transportation (HDOT) will be holding a Public Informational Meeting to inform the public of construction work on the Ala Moana Boulevard Drainage Repair project in the vicinity of Queen Street to Piikoi Street and to consult the public on a noise variance from the project’s noise variance permit. The project’s approximate start date may be as early as this fall and is expected to be completed within six months from the start of construction, weather permitting. The project consists of replacing the top slab of a concrete double box culvert and roadway pavement reconstruction near the culvert repair work. The construction work includes removing the roadway pavement above the top of the culvert, replacing the top slab of the concrete box culvert with pre-cast planks, and reconstructing the roadway pavement. The consultation meeting is accessible for individuals with disabilities. For more information or to request an auxiliary aid or service (e.g., sign language, interpreter, specific language interpreter, designated parking, and materials in alternate format), contact Mr. Robert Shin at (808) 679-7167 or robert.shin@hawaii.gov by July 6, 2017.